Let’s face it, weeds don’t have a good reputation—with good reason. Though some of them are quite attractive, they generally don’t behave well, showing up uninvited, stealing resources from your specimen plants, and quickly taking over the garden. 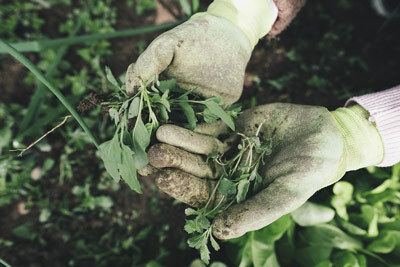 Experienced gardeners understand the importance of staying ahead of the weeds by taking measures to discourage them in the first place, and vigilantly eradicating them the moment they appear. And, make no mistake, in spite of your best efforts, the weeds will appear; they’re purpose-built to endure and multiply quickly. While there are many chemical herbicides on the market that promise to eliminate them instantly, we favor natural ways to kill weeds. Pulling up weeds manually and/or using natural weed killer are not only safer for you and the environment, they’re more effective in the long run. Unfortunately there is no magical formula or method—chemical or natural—to get rid of weeds permanently. And, while there’s no question weeding is hard work, and a task most of us would love to avoid, along with, say, vacuuming and raking leaves, if you ignore the problem, it only gets harder over time. You best bet is to follow the lead of other successful gardeners and stay ahead of the weeds once you’ve established (or reclaimed) your garden. When first creating a garden bed, it’s critical that you remove pre-existing grass (lawn) and weeds first. For purposes of this discussion, we include grass in our definition of weeds, as it’s pervasive and will make every effort to infiltrate your garden beds. There are several ways to eliminate existing plant growth where you’re locating your new garden bed. The first method, which is also the most straightforward, is to dig up sod and weeds with a shovel or a spade. The argument for this approach is that you’ll be able to plant your garden immediately. But, the downside is, of course, that it can be back-breaking work. And, when you remove sod or a large volume of established weeds, you are also removing topsoil and other organic material. This soil should be replaced by a mixture of soil, peat moss and compost—both to ensure the health of your prospective plants, as well as to raise the level of the garden bed to ensure proper water drainage. Please note that moist (not soaking wet) soil makes it easier to pull weeds. Another approach is to use a rototiller to break up existing plant growth, and then remove the remaining clumps of grass or weeds by hand. The main advantages here are that you retain more organic matter in the soil and can plant your garden immediately. The downside to using a rototiller is that by deeply disturbing the soil, it can disrupt the soil’s ecosystem, reducing soil quality over time, and encouraging the growth of other types of weeds. Rototilling also releases carbon from the soil into the atmosphere, which isn’t good for plants or people. A third method for removing grass and weeds is to smother them with newspaper, cardboard, or plastic securely anchored to the earth. Covering the plants cuts off their light and raises soil temperature causing them to die. This requires advance planning as it can take many months to accomplish. For most regions of the country, you would probably want to do this in the fall to be ready for spring planting. The downside is that in addition to having to wait to plant, smothering unwanted plants can destroy other organisms too. If, on the other hand, rather than trying to remove weeds to prepare for a new garden, you’re faced with the challenge of renovating an existing garden overgrown with weeds, you will have to consider some additional tactics. The same principles outlined above apply: there is no magical solution; only hard work. And, herbicides are not the answer, especially in a bed where you’re trying to preserve the existing plants. First, if it’s a big garden (or gardens), start small, working to reclaim one area at time. It’s helpful to remove the larger weeds, including unwanted tree and shrub seedlings, first, so it’s easier to see what you’re working with. You can start weeding an established garden at any time, though it’s easiest when the plants are small in early spring, removing them before they’ve had an opportunity to set seed (and reproduce!). 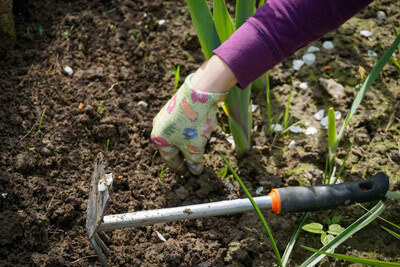 Don’t be afraid to dig up and transplant perennial flowers, as well as shrubs and trees you want to keep. As a side note, regular dividing of perennials is important to maintain their vigor. To pull up the weeds by hand, use a trowel or weeder (dandelion fork) to loosen and remove the entire weed, roots and all. Some weeds, like dandelions and thistles, for example, have tap roots that are challenging to remove intact because they extend deep into the soil. But don’t be tempted to cut corners and leave some of the plant behind; the roots will regenerate and the plant will return with a vengeance. Particularly invasive weeds should be disposed of in the trash, not in the compost or yard debris pile, or they will recolonize wherever you deposit them (or elsewhere in your yard with the help of your local birds). Contact your local university extension service for information on the invasives in your region. Pour boiling water on the plants you want to destroy. Pour salt water on the plants. Note, do not resort to this remedy on a large scale or it may render your garden uninhabitable for plants. DIY herbicide using vinegar. Put some regular household vinegar in a sprayer bottle and aim at the weeds. For best results, apply on warm, sunny days (over 80° F). High volume and concentrations of vinegar are not eco-friendly. Blowtorch or radiant heat weeders—particularly useful for getting at weeds between walkway pavers. DO NOT do this if you live in a dry region prone to wildfires. If all those methods fail or don’t seem practical, another approach is to transplant the specimen plants temporarily to another open garden bed or containers and cover the bed with plastic for a few months to smother the weeds en masse. Or, if you live out in the country, borrow a neighbor’s goat for a day. 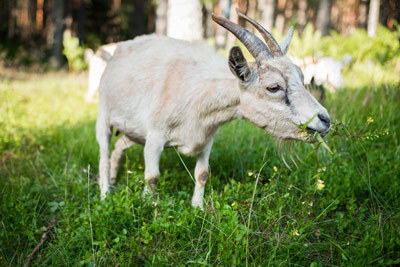 Goats LOVE weeds. You need to move FAST planting your intended flowers and crops. Otherwise, the weeds will soon take over (again). And, be sure to apply a thick (2-3 inches) layer of mulch which will deter new weeds from germinating. Be sure to re-apply mulch every year. Dealing with weeds is a never-ending challenge that can seem daunting to the uninitiated. However, once you do it for awhile, you may find that it’s surprisingly satisfying. Also, it’s a great way to spend time outdoors getting some exercise. You’ll be surprised how much you learn about nature hanging out in the garden.